We are pleased to introduce the new Alphatech Bold IP Series to our SIP door entry intercoms range. The Alphatech IP Bold Series will replace the ProTalk range, which is now due to go end of life. This new range of intercoms offers a wider selection of models with the choice of 1, 2 or 4 buttons, plus options for a camera and/or keypad. For those who are familiar with the ProTalk models, these intercoms are the perfect choice as they are similarly priced and are based on the same technology, whilst offering improved features and a brand new smarter look. Pricing and stock information is available on ProSys, our reseller portal. If you do not have a username or password you can request one by emailing us at: contact@provu.co.uk. If you would like a quote or need to discuss any projects in more detail, please feel free to contact our sales team on: 01484 840048. Lots of people have been asking us to recommend an app that works with the Protalk/Fermax IP range of door entry systems. Though there are hundreds of them on the Apple store, not all work perfectly with Protalk’s IP door entry system. There are 2 main issues. Multitasking means running an app in the background while the user can do other things. It is important to install/buy an app that supports multitasking if you wish to receive calls when the ipad/iphone is in sleep mode. Apple only ever allows a SIP application to work in the background (multitask) when it supports SIP over TCP. Its just the way they have built IOS(Apple’s operating system). When buying an app to work with a hosted solution or a PBX provider, make sure they support SIP over TCP. The solution is to use a PBX/Hosted provider which supports SIP over TCP or alternatively buy a SARK200 PBX which, along with offering other benefits, works for both video and audio over the TCP protocol. For for information about SARK 200 please click here. There are two applications that we have successfully tested with the Protalk video entry system. Please note that ProVu do not develop these applications. If the application crashes or stops working due to an update we cannot be held responsible. You will have to liaise with the company who develop these apps. You can now stream video directly from the Protalk door phone to your favourite rtsp streaming media server or VideoLan software. If you are unsure what rtsp means then have a look at this wiki page. This new feature will allow CCTV/Security installers to integrate video from the Protalk in existing video monitoring/recording software. Protalk builtin rtsp server support H264 or H263 video format and listen on port 554. To see video stream on VideoLan software. Open program then go to Open Media > Open Capture Device > Network and put “ ” finally press the Play button. 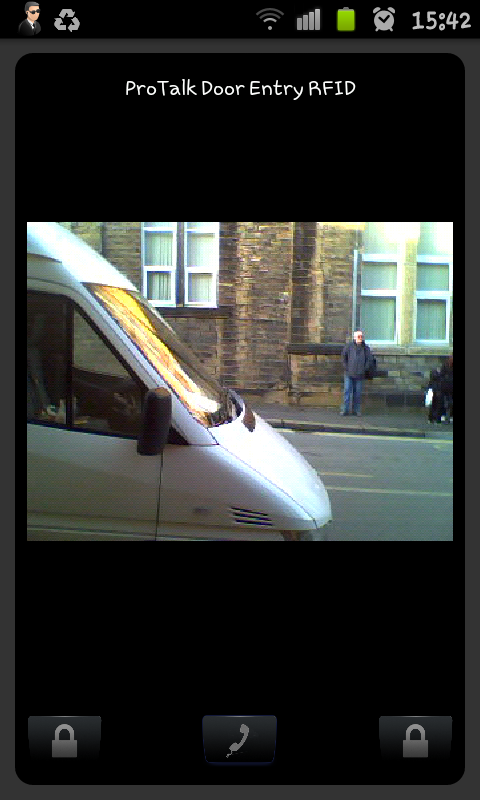 All being well you will see video from the door phone. If you want to force the rtsp server to use H263 or H264 then add the following in your url field. If you face problem with any of above please get in touch. This blog post applies to CityLine,SkyLine and SlimLine products. 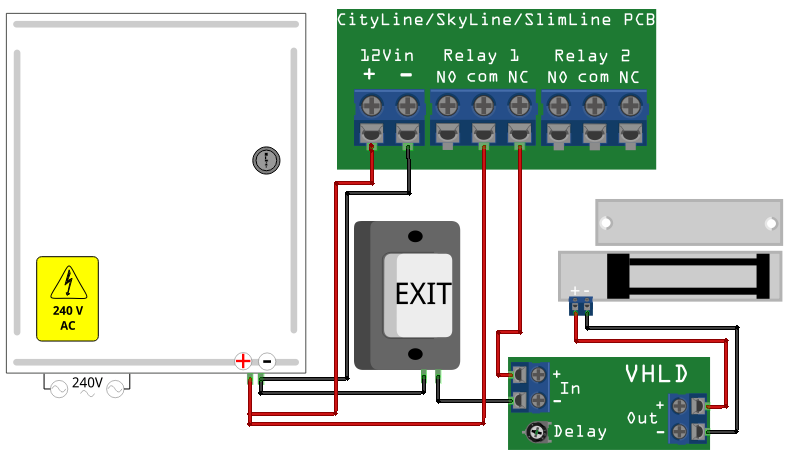 This connection diagram shows how to wire up a high-power (more than 350mA) electronic door lock using an external power supply with any of the CityLine, SkyLine or SlimLine range of door entry devices. These can all be bought from ProVu. This connection diagram shows how to connect a electronic door strike plate up to any of the CityLine or SkyLine IP door entry units we sell. The Door Entry unit cannot supply more than 350mA from the 12Vout connector, do not attempt to use a door lock which will draw more power or you will damage the door entry unit (and void the warranty!). If you have a more powerful door lock then a separate power supply must be used (which I’ll draw a diagram for soon). 12Vin is not shown connected as you can power the whole device & circuit from either this or Power-over-Ethernet. You can adjust the amount of time the door is unlocked for by setting the “delay” potentiometer on the VHLD board, anti-clockwise increases the delay. I will be drawing a series of these diagrams to suit various scenarios so keep checking here for more. We are pleased to announce first Android app for the Protalk door entry system. NOTE: This app also works with Cityline and Skyline products. You can monitor multiple door phones under one interface. User can unlock the door from the interface i.e by pressing the designated button on the screen. Also a call can be initiated from the app to the door phone. This app can sit in the background while you do other things. It support both sip server mode and peer to peer mode. 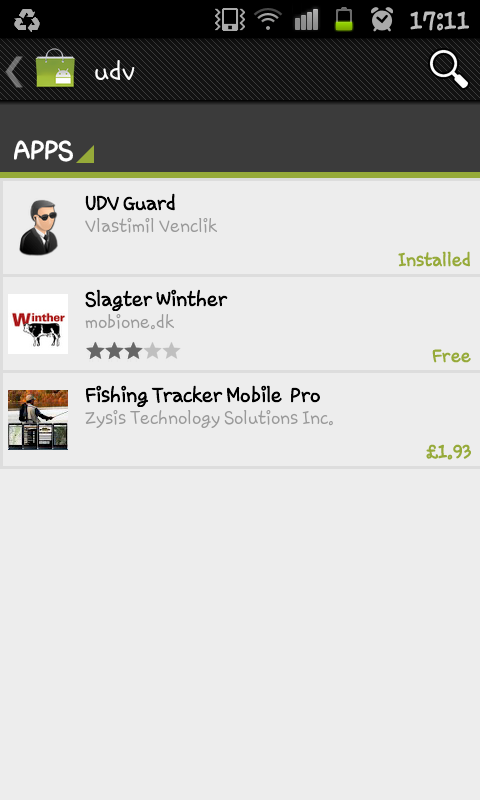 The UDVguard application is available free of charge from Google Market place. * Open Market place and search for UDVGuard. Install and run the program. * Select Menu >> Settings > DoorPhone Management. Add the IP address of the door unit to monitor. By default, the program offers parameters 192.168.1.250 and port 80. Change the IP address to match IP of the door phone. 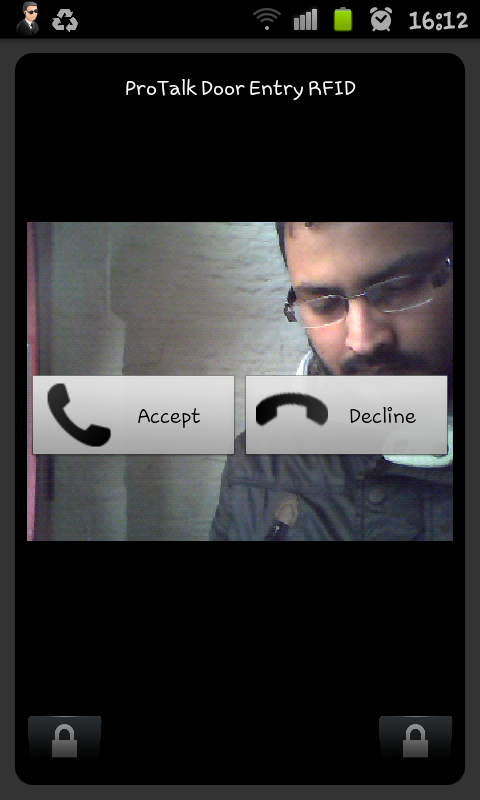 * If you want to software to pop up on incoming calls check “Pop Up” box . * Default audio mode is set to Peer-to-peer. Select it according to your requirement. If using SIP mode , remember to add sip user info in relevant fields. If everything is setup up properly you should be able to receive a call on your device if someone presses the button on the door. WARNING: This software runs in background. Please quit the software when not in use to save battery. 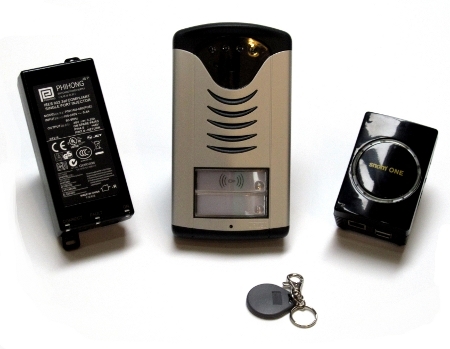 The ProVu team have now officially ditched their front door keys as a result of updating the door entry phone with the new Protalk RFID unit. All members of staff can now use their RFID tags to gain access to the building. A door release button has also been fitted to exit the building. The RFID unit is connected to electromagnetic door release locks enabling staff to enter without the need of a key. 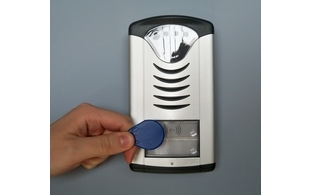 In an instance where a visitor needs to be let in, a member of staff can simply type a pre-defined key sequence into their phone keypad to release the door locks. Need somebody to to install your door entry unit and magnetic locks? Please send an email to contact@provu.co.uk and we’d be happy to give you our recommendations. Plus how to get your PBX or hosted service fully tested and approved for working with our IP Door entry systems. 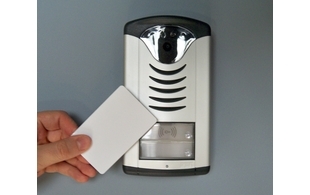 This new Slim IP Door entry model features an in-built RFID reader that enables authorised personnel to gain access to a building or office by simply presenting an RFID tag or card up to the unit. It is a really neat all in one system that eliminates the need for every one to have to speak with some one on the inside in order to gain access to the building. Of course normal visitors will simply press the single button below the RFID reader and speak with a receptionist or other person within the building. They can then allow visitors access in the normal way by tapping the default release code into their IP phone. By combining the new snom one mini PBX with our range of IP Door Entry systems we are now able to offer a extremely competitive low cost bundled solution. The snom SoHo PBX has a trade price of just £155 and is supplied complete with the snom ONE PBX software with up to 10 extensions. This bundle is ideal for those installations where a small phone system is required purely to route calls from the door entry system to IP phones or PCs. However being a fully featured business class PBX it will also provide the flexibility to route calls to other locations and or iPads or smart phones. If you would like us to list your hosted service or PBX system as approved for working with our IP Door Entry systems we will be happy to run the interop testing program for you. Or if you would like to evaluate a system and run your own interop tests we can make available some sample units on a unit on Sale or Return basis.